High Adventure Ranch is also proud to be home of the famed Razorback Hogs. These challenging animals should prove to be an exciting hunt for the experienced and the novice hunter alike as well as excellent table fare. Razorbacks are domestic Hogs that have gone wild and can be brown, black, white, or spotted. The Tennessee grown Razorback Hog is a fine addition to your wall and a necessity for any Boar hunter! Real Hog hunting for real hunters. Razorback Boar up to 300 lbs are hunted from December thru the end of August. 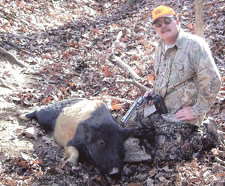 For more information on our Razorback Hog Hunts, please call (314) 209-9800 or fill out our contact form.